We get so excited when we see a new spin on our party rental pieces and we really wanted to share this fun, yet modern Mexican Fiesta with you! They used an eclectic mix of modern and rustic pieces, like the wood farm table above. That helped give it a more authentic feel and they added some bright, poppy colors to the mix to give it some great personality. 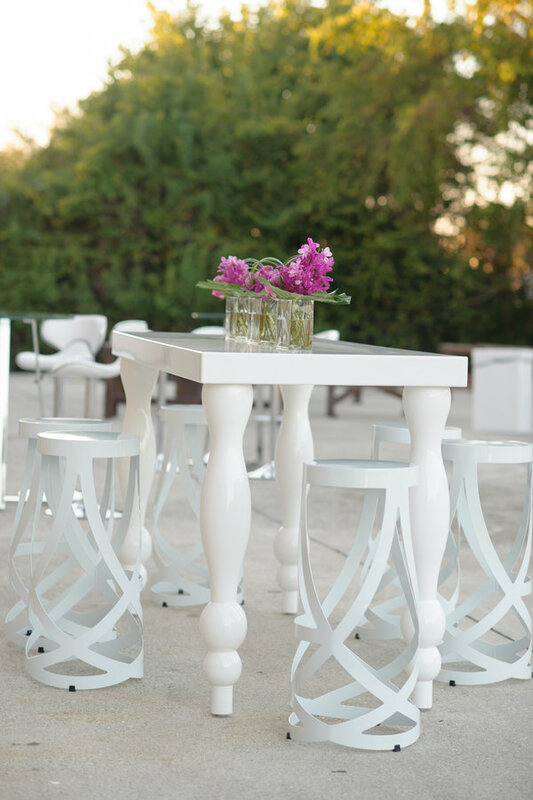 The event designer infused some modern touches as well by adding our Sophia lacquer communal tables to the mix. We thought this was a great way to give the party a bit more mod style. 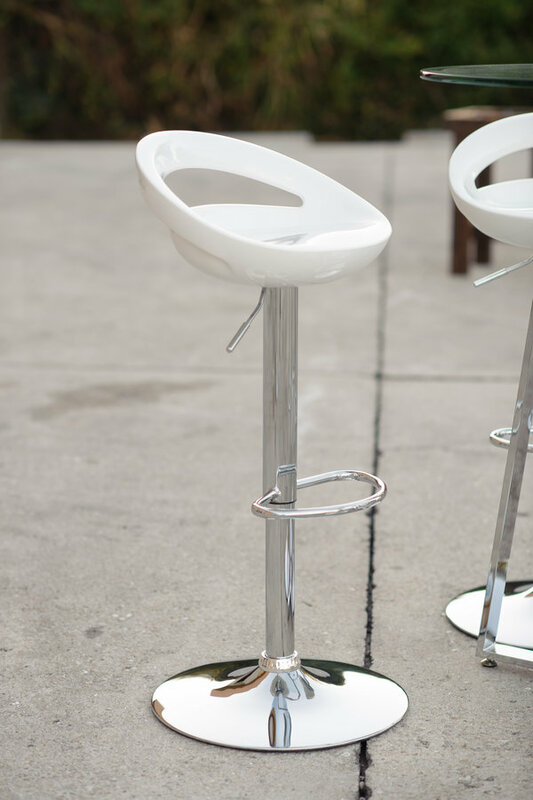 We especially love the seating they chose around the hightop table....our clear ECHO barstools. This helped give the assortment of lounge furniture a light and airy look. Last, but certainly not least is our modern white lounge furniture pieces...again...they add a lightness and modern edge to the decor. They can be perfectly accessorized to give an ode to the theme of the party..in this case they threw in some custom throws and accessories to add color. Pictured below is our curved back white sofa with a back rest. Also, we can't let our padded cubes and modern white coffee tables go unnoticed.... they helped complete the seating area perfectly! If you are wanting to plan a themed party and just don't know where to start...please give us a ring at 239-352-9000, we'd be happy to help pull out our archives and inspire you to create something all your own!! Look forward to talking with you soon!! 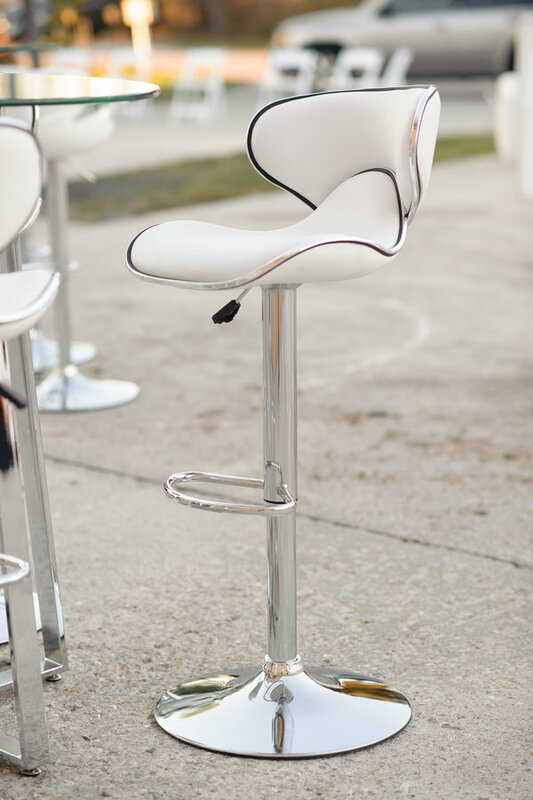 People often think of Niche Event Rentals for your more standard event rentals like chiavari chairs and table rentals, but we do have some really unique lounge furniture rentals that can help kick it up a notch for cocktail furniture rentals. Today we wanted to show off a few of our favs that are perfect to add some character to cocktail hour or even mix up your lounge areas and encourage your guests to circulate and mingle a bit more. The table above is one of our hottest rentals...it's called the Sophia lacquered table and is a great cocktail height communal table that has that modern south beach vibe. Here are just a few of the highlights from our inventory and we promise to do another post that features even more of our lounge furniture rentals. 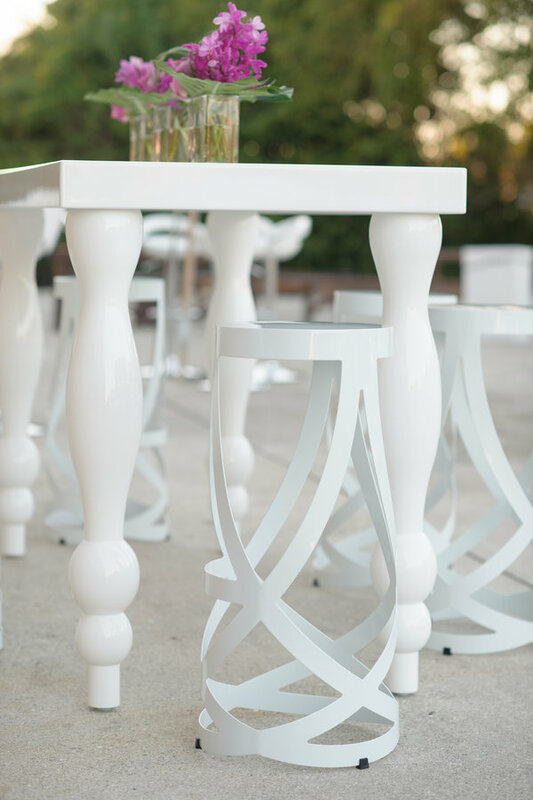 Our featured cocktail table above is one of our top sellers.....our sophia communal table in a sleek modern white cocktail table where a crowd can gather an enjoy cocktails in a larger group. Super fun and has a modern south beach vibe. A very special thanks to our friends at Luminaire Foto for capturing our modern cocktail lounge furniture so beautifully! Not sure where to start or figure out what matches best with your wedding decor? Call one of our rental specialists at 239-352-9000. 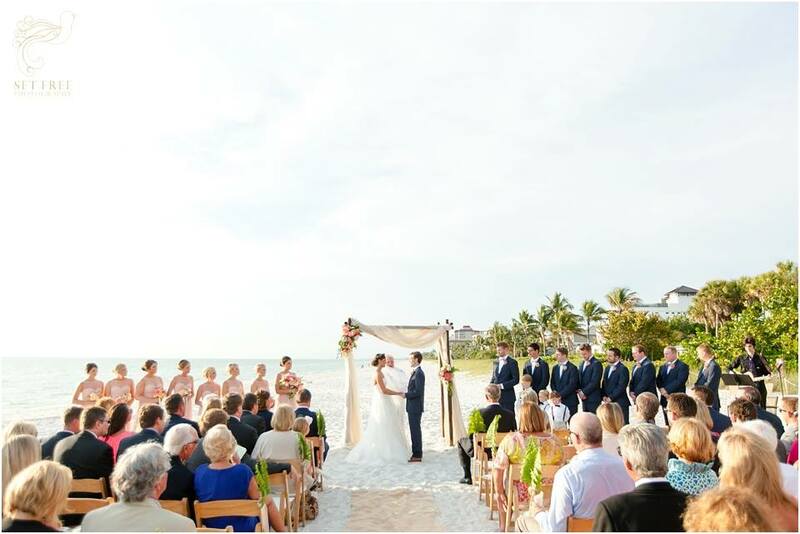 One very popular wedding venue in Southwest Florida that we make deliveries to almost every weekend is The LaPlaya Beach Resort right on Vanderbilt Beach in Naples. 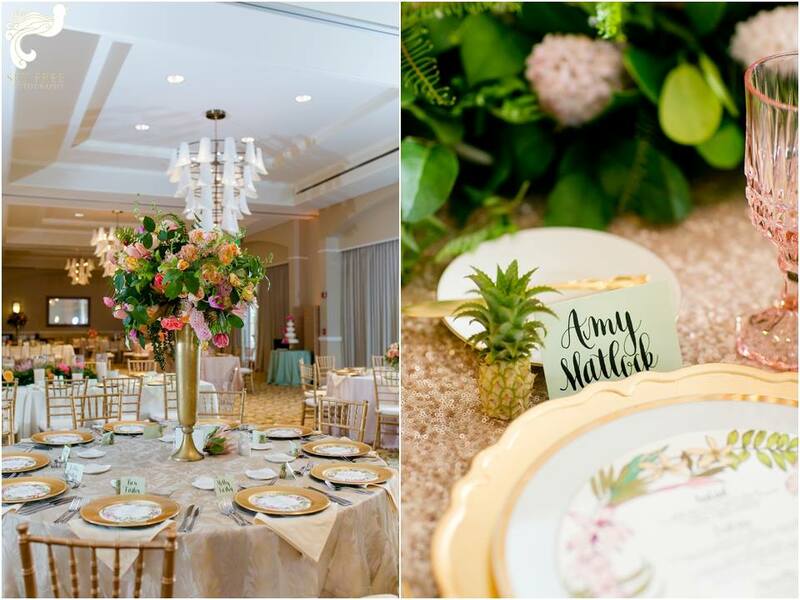 Today's feature is a really great one designed by Kehrin at Jet Set Wed. What we love so much about this wedding is that she mixed and matched so many of our wedding rentals from start to finish to create a look that was completely unique for this couples' beautiful Naples wedding. 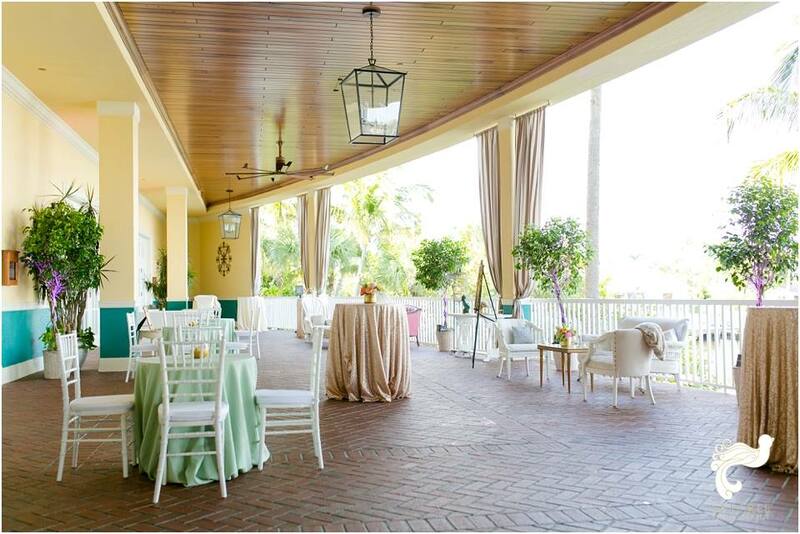 We love the casual vibe that our natural garden chairs offered to their wedding ceremony on the North Beach at La Playa. This lent a totally casual elegance to their surf side nuptials. Their guests then headed over across the street for cocktail hour on the terrace overlooking the bay. They used our classic white chiavari chairs to add a crisp lightness to their cocktail hour and it complemented the soft color palette of the linens they used on their tables. The party then continued on into the ballroom which was recently renovated with a more modern feel. They added a classic and elegant touch by using our gold chiavari chairs. It was a perfect tie in to all the beautiful touches on the tabletops. Once again, we love to see how the same space can be transformed by all our beautiful wedding rentals. Need some help and not quite sure where to start? I'm sure we have worked at your venue before! Give us a ring at 239-352-9000 and let's get's started!